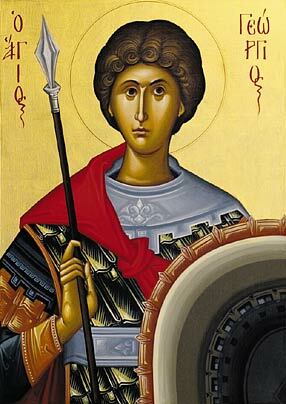 The Holy Great Martyr George the Victory-Bearer, was a native of Cappadocia (a district in Asia Minor), and he grew up in a deeply believing Christian family. His father was martyred for Christ when George was still a child. His mother, owning lands in Palestine, moved there with her son and raised him in strict piety. When he became a man, St George entered into the service of the Roman army. He was handsome, brave and valiant in battle, and he came to the notice of the emperor Diocletian (284-305) and joined the imperial guard with the rank of comites, or military commander. The pagan emperor, who did much for the restoration of Roman might, was clearly concerned with the danger presented to pagan civilization by the triumph of the Crucified Savior, and intensified his persecution against the Christians in the final years of his reign. Following the advice of the Senate at Nicomedia, Diocletian gave all his governors full freedom in their court proceedings against Christians, and he promised them his full support. Then by order of the enraged emperor the armed guards began to push St George out of the assembly hall with their spears, and they then led him off to prison. But the deadly steel became soft and it bent, just as the spears touched the saint’s body, and it caused him no harm. In prison they put the martyr’s feet in stocks and placed a heavy stone on his chest. The next day at the interrogation, powerless but firm of spirit, St George again answered the emperor, “You will grow tired of tormenting me sooner than I will tire of being tormented by you.” Then Diocletian gave orders to subject St George to some very intense tortures. They tied the Great Martyr to a wheel, beneath which were boards pierced with sharp pieces of iron. As the wheel turned, the sharp edges slashed the saint’s naked body. At first the sufferer loudly cried out to the Lord, but soon he quieted down, and did not utter even a single groan. Diocletian decided that the tortured one was already dead, and he gave orders to remove the battered body from the wheel, and then went to a pagan temple to offer thanks. At this very moment it got dark, thunder boomed, and a voice was heard: “Fear not, George, for I am with you.” Then a wondrous light shone, and at the wheel an angel of the Lord appeared in the form of a radiant youth. He placed his hand upon the martyr, saying to him, “Rejoice!” St George stood up healed. When the soldiers led him to the pagan temple where the emperor was, the emperor could not believe his own eyes and he thought that he saw before him some other man or even a ghost. In confusion and in terror the pagans looked St George over carefully, and they became convinced that a miracle had occurred. Many then came to believe in the Life-Creating God of the Christians. Two illustrious officials, Sts Anatolius and Protoleon, who were secretly Christians, openly confessed Christ. Immediately, without a trial, they were beheaded with the sword by order of the emperor. Also present in the pagan temple was Empress Alexandra, the wife of Diocletian, and she also knew the truth. She was on the point of glorifying Christ, but one of the servants of the emperor took her and led her off to the palace. The emperor became even more furious. He had not lost all hope of influencing St George, so he gave him over to new and fiercesome torments. After throwing him into a deep pit, they covered it over with lime. Three days later they dug him out, but found him cheerful and unharmed. They shod the saint in iron sandals with red-hot nails, and then drove him back to the prison with whips. In the morning, when they led him back to the interrogation, cheerful and with healed feet, the emperor asked if he liked his shoes. The saint said that the sandals had been just his size. Then they beat him with ox thongs until pieces of his flesh came off and his blood soaked the ground, but the brave sufferer, strengthened by the power of God, remained unyielding. The emperor concluded that the saint was being helped by magic, so he summoned the sorcerer Athanasius to deprive the saint of his miraculous powers, or else poison him. The sorcerer gave St George two goblets containing drugs. One of them would have quieted him, and the other would kill him. The drugs had no effect, and the saint continued to denounce the pagan superstitions and glorify God as before. When they led St George down to the graveyard, he cried out, “O Lord! Show to those here present, that You are the only God in all the world. Let them know You as the Almighty Lord.” Then the earth quaked, a grave opened, the dead one emerged from it alive. Having seen with their own eyes the Power of Christ, the people wept and glorified the true God. The sorcerer Athanasius, falling down at the feet of St George, confessed Christ as the All-Powerful God and asked forgiveness for his sins, committed in ignorance. The obdurate emperor in his impiety thought otherwise. In a rage he commanded both t Athanasius and the man raised from the dead to be beheaded, and he had St George again locked up in prison. The people, weighed down with their infirmities, began to visit the prison and they there received healing and help from the saint. A certain farmer named Glycerius, whose ox had collapsed, also visited him. The saint consoled him and assured him that God would restore his ox to life. When he saw the ox alive, the farmer began to glorify the God of the Christians throughout all the city. By order of the emperor, St Glycerius was arrested and beheaded. St George cried out, “How dare you remain here, when I, the servant of the true God, have entered?” Then noises and wailing were heard from the idols, and they fell to the ground and were shattered. There was general confusion. In a frenzy, pagan priests and many of the crowd seized the holy martyr, tied him up, and began to beat him. They also called for his immediate execution. The holy empress Alexandra tried to reach him. Pushing her way through the crowd, she cried out, “O God of George, help me, for You Alone are All-Powerful.” At the feet of the Great Martyr the holy empress confessed Christ, Who had humiliated the idols and those who worshipped them. Diocletian immediately pronounced the death sentence on the Great Martyr George and the holy Empress Alexandra, who followed St George to execution without resisting. Along the way she felt faint and slumped against a wall. There she surrendered her soul to God. St George gave thanks to God and prayed that he would also end his life in a worthy manner. At the place of execution the saint prayed that the Lord would forgive the torturers who acted in ignorance, and that He would lead them to the knowledge of Truth. Calmly and bravely, the holy Great Martyr George bent his neck beneath the sword, receiving the crown of martyrdom on April 23, 303. 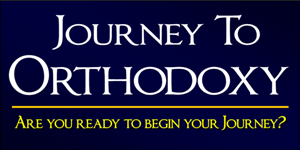 The pagan era was coming to an end, and Christianity was about to triumph. Within ten years, St Constantine (May 21) would issue the Edict of Milan, granting religious freedom to Christians. Of the many miracles worked by the holy Great Martyr George, the most famous are depicted in iconography. In the saint’s native city of Beirut were many idol-worshippers. Outside the city, near Mount Lebanon, was a large lake, inhabited by an enormous dragon-like serpent. Coming out of the lake, it devoured people, and there was nothing anyone could do, since the breath from its nostrils poisoned the very air. On the advice of the demons inhabiting the idols, the local ruler came to a decision. Each day the people would draw lots to feed their own children to the serpent, and he promised to sacrifice his only daughter when his turn came. That time did come, and the ruler dressed her in her finest attire, then sent her off to the lake. The girl wept bitterly, awaiting her death. Unexpectedly for her, St George rode up on his horse with spear in hand. The girl implored him not to leave her, lest she perish. The saint signed himself with the Sign of the Cross. He rushed at the serpent saying, “In the Name of the Father and of the Son and of the Holy Spirit.” St George pierced the throat of the serpent with his spear and trampled it with his horse. Then he told the girl to bind the serpent with her sash, and lead it into the city like a dog on a leash. The people fled in terror, but the saint halted them with the words: “Don’t be afraid, but trust in the Lord Jesus Christ and believe in Him, since it is He Who sent me to save you.” Then the saint killed the serpent with a sword, and the people burned it outside the city. Twenty-five thousand men, not counting women and children, were then baptized. Later, a church was built and dedicated to the Most Holy Theotokos and the Great Martyr George.